Batman (with Firing Projectile Launcher!) vs The Joker (with Dynamite Bundle & Pistol!) 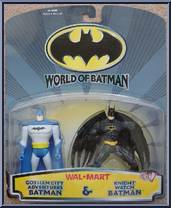 BATMAN A hero of mystery, Batman leads a double life, his true identity of Wayne Enterprises CEO, Bruce Way. . .
Lunar Force Batman (with Night Attack Wing) Night Spark Joker (with Wildcard Launcher) Lunar Force Batman MISSION: 5967XGC STATUS: It will take all Batman's skills - and the power of his cutting e. . .
Night Shadow Batman (with Hyper-Speed Stun Rockets) Night Fury Robin (with Triple-Bolo Sticker) Night Shadow Batman MISSION: 6221GC STATUS: Under the dark shadows of the Gotham City night, the city'. 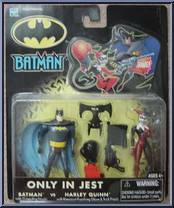 . .
Batman (with Grappling Hook!) vs Harley Quinn (with Knockout Punching Glove & Trick Pistol!) BATMAN In his ongoing war against evil, Batman has confronted criminals of every sort, from the cruell. . .
(with Rescue Pack & Water Cannon) Hundreds of suspicious fires have been wreaking havoc on Gotham City! With the fire department overwhelmed and exhausted, it's up to Batman to douse these blaze. . .
As the battle against the forces of injustice rages on, Batman utilizes the most advanced and specialized gear to help him crush crime! With his specialized gear, Cave Climber Batman can reach villai. . .
(with Missile Flightpack) Detecting some puzzling activity in the vast Kalahari desert, Batman speeds to Africa to investigate. Sensing the involvement of the Riddler, the Dark Knight dons specializ. . .
(with Glider Wings and Extension Claw) As the battle against the forces of injustice rages on, Batman utilizes the most advanced and specialized gear to help him crush crime! 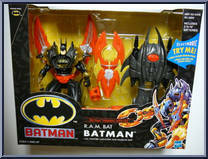 Glider Strike Batman ta. 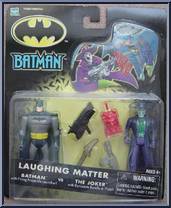 . .
(with Electro Trap & Machete) Somewhere in the rainforests of South America, the Joker has built his most dangerous weapon yet - the Laughinator laser cannon. Hunting him down is Jungle Tracker . . .
(with Rocket Skis and Flame Missile) As the battle against the forces of injustice rages on, Batman utilizes the most advanced and specialized gear to help him crush crime! With his specially modifi. . .
(with Batboat Racer & Blasting Torpedoes) Deep within Gotham Canyon, the Riddler prepares to launch an entire arsenal of quiz missiles from a secret weapons platform! This could spell the end fo. . .
(with Robot-Body and Ice Blaster) Just like Batman, the villains of Gotham City are using new technologies - but the villains are using them to help in their diabolical plans! Insect Body Mr. Freeze. . .
(with Question Mobile & Quiz Missile) Gotham City's most baffling villain - The Riddler - is at it again! This time it's with the help of his powerfully puzzling Question Mobile. Armed with &ld. . .
(with Jetblade Sled) The Batcomputer has picked up high levels of radioactivity far above the Arctic Circle. Suspicious that the evil Mr. Freeze is developing a new and powerful weapon of mass destr. 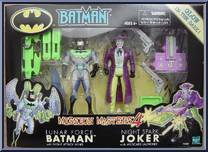 . .
(with Energy-Wave Dish & Launching Cannon) In the desolate flats of Gotham City, the Joker is building an army of heavily-armed clown robots to take command of the entire town. Unable to battle . . .
(with Firing Missile) In the dead of the night, a band of masked saboteurs scale the Gotham City Bank skyscraper. Using glass-cutting instruments, they're about to infiltrate the building and take c. . .
(with Battle Shield Launcher) MISSION: 3002GC STATUS: The super-humanly strong Bane has escaped from Arkham Asylum and is terrorizing Gotham City! MISSION: Batman must track down Bane and confro. . .
(with All-Terrain Batsled & Batarang) MISSION: 1312GC STATUS: Mr. Freeze has sealed Gotham City in an impenetrable layer of ice. 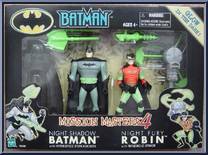 Inside the Gotham City Police Department building, he holds Co. . .
(with Sliding Cable Gear) MISSION: 5055GC STATUS: Trouble in Gotham City… A gang of villains has smuggled nuclear weapons components by boat into the city's wharf area. There, in an abando. . .
(with Rescue Pack & Extinguisher) MISSION: 1173GC STATUS: Two-Face has flipped his double-sided silver coin… and it's landed on the race of evil! Now, wild fires rage throughout Gotham. . .
(with Glider & Batarang Claw) Knight Assault Batman Mission: 1141GC STATUS: Using her vast store of botanical knowledge, Poison Ivy has created a lethal toxin from the roots of exotic plants mi. 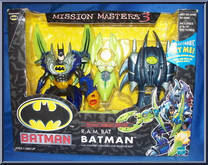 . .
(with Launching Batarang Hook) Mountain Pursuit Batman Mission: 2435GC STATUS: The evil Mr. Freeze has established a secret base in the mountains outside Gotham CIty. But the Dark Knight's powerfu. . .
(with Batarang Launcher) MISSION: 3558GC STATUS: When the maniacal Joker invades governmental computer systems, he is able to gain sole access to America's nuclear arsenal. Now the fate of the wo. . .
(with Blastwing Backpack & Smoke Torpedos) Sky Attack Batman Mission: 5221GC STATUS: Gotham City is under attack... from above! High-tech bandits have mounted an aerial assault in the skies ov. . .
(with Circuit-Tech Heat Blaster) MISSION: 9595GC STATUS: Mr. Freeze has learned how to digitize himself and has invaded the Internet! 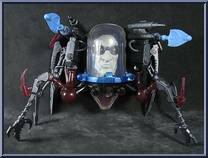 Now he roams the endless corridors of the World Wide Web in h. . .
(with Arachnotech Assault Module) STATUS: Mr. Freeze has learned how to digitize himself and has invaded the Internet! Now he roams the endless corridors of the World Wide Web in his ruthless pursu. . .